A Breville juicer offers far more than just a way of using up overripe fruit or whipping up smoothies for the kids. 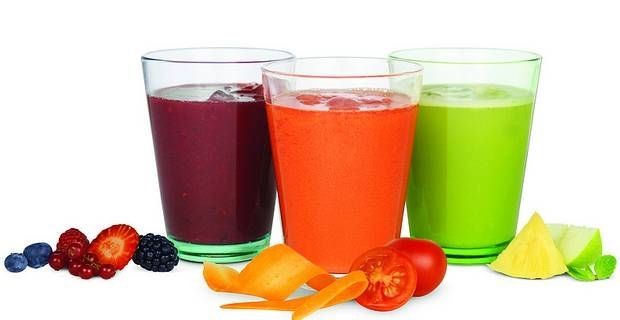 By exploring its capabilities you can discover tasty and healthy new vegetable and fruit juice cocktails. They are very easy to make and the ideal, vitamin-packed way to start the day. A Breville juicer is a versatile and tough piece of kitchen kit that can tackle the toughest vegetables as well as making delicious fruit punches and smoothies. Follow the instructions for your machine, but be open to imaginative combinations. A green juice cocktail is particularly virtuous, created by juicing cucumber, kale, parsley, celery and apple. Adjust the apple content for sweetness and add a little ginger if it tastes too bland. This is your five-a-day in a glass. In the heat of summer, mix melon, pear, cucumber and apple for a cool and refreshing afternoon drink served over ice with a sprig of mint. During the berry glut of a British midsummer, combine strawberries, raspberries and blueberries in a vivid fruit crush. Add blackcurrants and redcurrants for a touch of sharpness and for their vitamins. Celery and fennel form the basic of a dry, chic, highly-flavoured vegetable juice. Add sharp apples or pears to adjust the sweetness slightly, but allow the aniseed flavour of the fennel to dominate. In winter don't neglect your juicer. Beetroot, carrot, ginger and celery make a great base for a warming vegetable juice. Add freshly-grated horseradish for an extra kick. Mix sweet and sour by combining grapefruit, carrot and beetroot.The colour is a vivid purple and the health benefits immeasurable. The key to getting the most out of your Breville juicer is experimentation. Along the way you may create some undrinkable concoctions but just throw them on the compost and start again. Add body and texture by using carrots, bananas or even almonds, while ginger, chilli, mint and basil offer great flavour options.